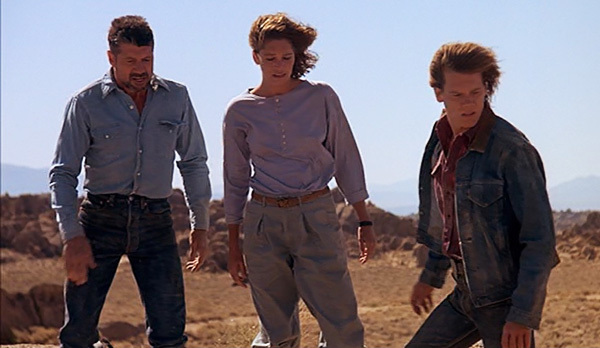 Val (Kevin Bacon) and Earl (Fred Ward) do a little bit of everything around the small town of Perfection, Nevada, in the middle of the desert. They are ready for a change, but that change comes in a very different way from what they expect when they and the entire town come under attack from giant snakes that burrow underground. Suddenly the entire small population of Perfection has to fight for their survival. 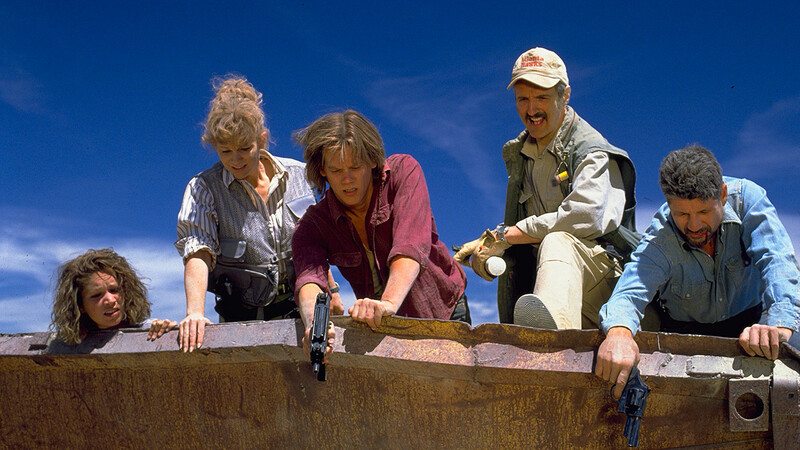 I know that Tremors has gained quite a cult-following, but maybe it needs the nostalgia factor to really see why that’s the case. I saw it for the first time at the /slash and I thought it was nice, but I didn’t love it. There were a lot of things that I found… almost adorable about the film. I liked the characters, I liked the monsters, I liked looking at Fred Ward. But as you may be able to read between the lines already: I couldn’t quite take the film all that seriously. By that I don’t mean that I didn’t see that it was trying to be funny, but even when you’re funny, your film needs a certain weight to have impact, to ellicit more than a simple smile every now and then. And that’s what was lacking for me with Tremors. Watching it became more like watching the TV in a crowded bar out of the corner of your eyes than actually watching the film. What you see there doesn’t look so bad, but it’s not like you’re actually engaged in the film. Admittedly, I was quite surprised when I looked at my watch about an hour into the film because I thought that at least 90 minutes had passed at that point. This made the rest of the film feel even longer. And yet, there is a certain charm to the film that I won’t deny. The special effects were really great, too. I just didn’t fall into it at all – and a certain amount of falling is necessary for a film to work. This entry was posted in movies and tagged /slash Filmfestival, 1990, Ariana Richards, Brent Maddock, Charlotte Stewart, Finn Carter, Fred Ward, Kevin Bacon, Michael Gross, Reba McEntire, Richard Marcus, Robert Jayne, Ron Underwood, S.S. Wilson, Tony Genaro, Tremors, Victor Wong by kalafudra. Bookmark the permalink.